The New Orleans Saints opened their 17th NFL season on September 4, 1983, and while they had yet to finish with a winning record, there was hope for continued progress following a 4-5 result in the strike-shortened ’82 season. Heading into their third year with Bum Phillips as head coach, the Saints had assembled promising young talent that included RB George Rogers, LB Rickey Jackson, DE Bruce Clark, and others who were making the club more competitive. Rogers, in particular, had rushed for 1674 yards as a rookie in 1980 after winning the Heisman Trophy at South Carolina, but was coming off of an injury-plagued ’82 season and was looking to bounce back. Another promising player, QB Dave Wilson, had missed all of the previous year due to knee surgery and was viewed as the heir to the starting quarterback job, although 37-year-old Ken Stabler had resurrected his career with New Orleans in ’82 and was still the quarterback of the present. Opposing the Saints in the opener were the St. Louis Cardinals, coming off of a 5-4 record that had qualified them for the playoffs in the expanded tournament format adopted due to the strike. Starting their fourth year under Head Coach Jim Hanifan, the Cards were also in the midst of a transition at quarterback, with Neil Lomax having taken over the starting duties from 39-year-old Jim Hart. RB Ottis Anderson was highly productive and there were talented targets in WR Roy Green, a converted defensive back, and Pat Tilley, a fine possession receiver. There were 65,225 fans in attendance at the Louisiana Superdome. Following a short series by the Saints that ended with a punt (not to mention the loss of Ken Stabler due to injury suffered when hit by DT Elois Grooms while passing), the Cards, starting off with good field position at the New Orleans 47, drove to the game’s first score. Ottis Anderson carried four times for 29 yards and Neil Lomax completed two passes, the second for an 11-yard touchdown to TE Doug Marsh. Neil O’Donoghue added the extra point for a 7-0 lead. New Orleans took possession and George Rogers carried twice for 16 yards before Dave Wilson, the replacement for Stabler, threw to TE Hoby Brenner for nine yards and then to WR Jeff Groth for a 42-yard gain to the St. Louis 35. 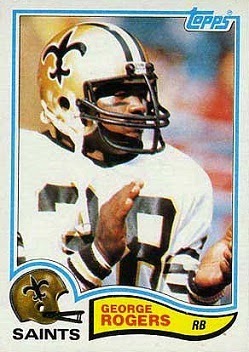 However, the Saints came up empty when, three plays later, LB Bob Harris intercepted a Wilson pass. The teams traded punts as the game headed into the second quarter and New Orleans then put together an 88-yard drive in seven plays. The big play along the way was a 36-yard carry by Rogers to the St. Louis 15, and three plays later RB Wayne Wilson ran nine yards up the middle for a TD. Morton Andersen’s extra point tied the score. The Cards responded by moving the ball well on their next series. Lomax completed three passes, including one to WR Mike Shumann for 33 yards to the New Orleans 19 in a third-and-five situation. A penalty on the Saints advanced the ball inside the ten, but two Lomax passes fell incomplete and O’Donoghue’s field goal attempt from 24 yards sailed wide to the left. Starting from their own 20, the Saints drove into St. Louis territory once again. Rogers carried three times for 24 yards and FB Hokie Gajan ran for 14 yards, but on a third-down play at the Cards’ 38, Wilson fumbled while being sacked by DE Al “Bubba” Baker and DT Mark Duda recovered. St. Louis made the Saints pay for the turnover, advancing 21 yards in seven plays that resulted in O’Donoghue booting a 47-yard field goal with 48 seconds left on the clock. The Cardinals took a 10-7 lead into halftime. Lomax was out with a shoulder injury and the veteran Jim Hart was at quarterback when St. Louis started off the third quarter, and he completed his first four passes, most notably one of 26 yards to Pat Tilley. The drive bogged down after reaching the New Orleans 14, however, with Anderson being thrown for a loss on a draw play and Hart tossing two incompletions. The Cards came up empty when O’Donoghue missed on a 38-yard field goal try. It didn’t take long for the Saints to turn the tables. On their second play, Rogers took a handoff, went through the middle of the line, and then cut to the right, breaking a couple of tackles along the way to a 76-yard touchdown. Andersen added the extra point and, instead of the Cardinals adding to their lead, New Orleans was in front by 14-10. It got worse for the visitors on the second play after the kickoff when a Hart pass was deflected and intercepted by LB Dennis Winston, who fumbled after returning it 15 yards, but CB Rodney Lewis (who knocked the ball off course in the first place) recovered at the New Orleans five. Three plays later, Rogers scored again, this time from a yard out. Andersen’s PAT put the Saints up by 11 points at 21-10. The teams exchanged punts before the Cardinals put together a long series that extended into the final period. Just before the end of the third quarter, Hart completed a third-and-19 pass to Roy Green for 20 yards to reach the New Orleans 46. Green picked up another 25 yards on a reverse, but once again the drive bogged down and a field goal attempt went awry, this time due to a bad snap that was batted away and gave the Saints possession at midfield. The Saints capitalized on their good fortune, moving 50 yards in five plays. Wilson threw deep for WR Kenny Duckett in the end zone, who hauled it in for a 35-yard touchdown. Andersen converted and the Saints enjoyed a comfortable 28-10 lead. The Cardinals fought back with a nine-play, 72-yard possession. Hart completed five passes, the last for 16 yards and a TD to Tilley, but that was it. There were just over five minutes remaining to play, and the visitors had the ball once more to no effect before succumbing by a final score of 28-17. The Saints gained the most yards (383 to 340) while St. Louis had the edge in first downs (20 to 15). New Orleans was far more productive on the ground, gaining 272 rushing yards, while the Cardinals produced 225 net yards through the air. The Saints recorded four sacks, to one by St. Louis, although they were also penalized 14 times, at a cost of 101 yards, to 8 flags for 50 yards on the visitors. New Orleans also turned the ball over twice, to one suffered by the Cards, but St. Louis was damaged by failures on field goals, two by missed kicks and one on a bad snap. George Rogers rushed for a team-record 206 yards on 24 carries that included two for scores. Hokie Gajan added six attempts for 34 yards and Wayne Wilson contributed 32 yards and a TD on his 10 carries. Dave Wilson didn’t go to the air often, completing 7 of 11 passes for 121 yards and a touchdown along with an interception. Jeff Groth, Kenny Duckett, and Hoby Brenner each had two catches apiece, for 50, 44, and 23 yards, respectively, and Duckett scored a TD on one of his. 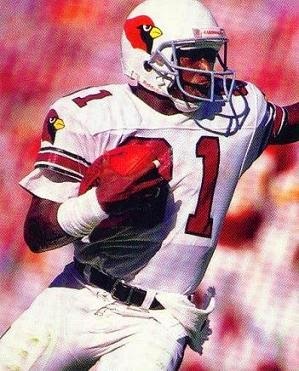 For the Cardinals, Neil Lomax was successful on 11 of 16 throws for 111 yards and a touchdown, while giving up no interceptions, before leaving the contest and Jim Hart went 11 of 20 for 141 yards with a TD and an interception in relief. Ottis Anderson ran for 60 yards on 18 carries. Roy Green (pictured above) caught 8 passes for 82 yards and added 25 yards on his one running play. Pat Tilley contributed 65 yards on four receptions that included one for a score. New Orleans lost the next week but went on to post an 8-8 record and finished third in the NFC West, just missing out on a winning record and playoff spot with a loss to the Rams in the season finale. The Cardinals started out at 1-5 before surging during the second half of the year and ending up with an 8-7-1 tally and third place in the NFC East. George Rogers injured his knee the following week and missed three games, but was productive the rest of the way as he rushed for 1144 yards on 256 carries (4.5 avg.) and scored five touchdowns. He went over a hundred yards three more times. After being dealt to Washington in 1985, Rogers matched his 206-yard rushing total, also in a contest against the Cardinals.